Nine SLOW juniors enjoyed the half term sunshine with a training session on Esher Common on Thursday 1 June. The session used three of the permanent courses that SLOW set up on Esher Common in collaboration with Elmbridge District Council. 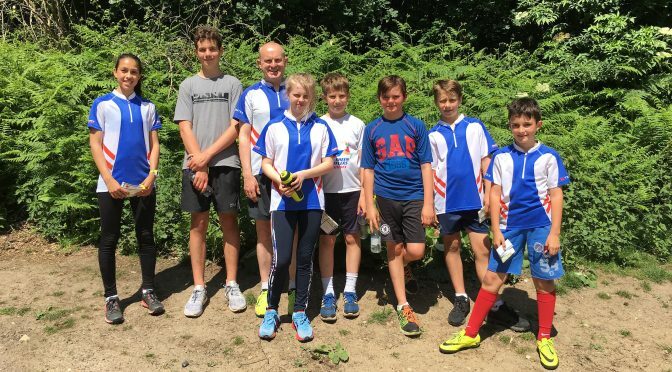 The juniors aged 9 to 15 years all practised their technical orienteering skills – map orientation and route choice – on the Yellow course in the woods above West End Common to the west of the Portsmouth Road, before heading to Esher Common and running on the longer Orange and Light Green courses. The weather was fantastic and everyone came away from the morning having improved their technique and more confident on the harder courses, ahead of the southeast relays on Sunday 18 June. Many thanks to Paul Couldridge and Pete Huzan who gave up their time to coach, the juniors and of course their parents who came along for the morning.